The lazy hazy days of summer are on the way! Our friends at GRIT, home of the Freedom Chair – the only all terrain wheelchair designed at MIT – believe that everyone, regardless of mobility level, should have the opportunity to live an adventurous life. 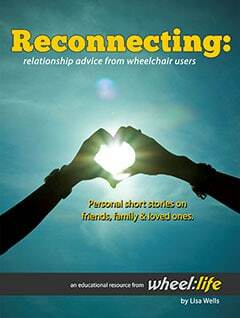 That’s why Wheel:Life is sharing their comprehensive guide to make sure this summer is your best one yet. Forget the big bulky beach chairs of summer’s past: the GRIT Freedom Chair is made from bicycle parts, and our 2.25” wide beach tires are no exception. This means you can stay sleek – and independently mobile – while enjoying the sun and sand. The biggest bonus? The patented lever drive means your biceps will get tanned and toned, all while eliminating shoulder strain. Whether you’re riding solo or with friends, there’s nothing more magical than a summer trip on the open road! The Freedom Chair is easy to disassemble, so it fits in the trunk of any car, even a compact. Not sure of a destination? Your friendly neighborhood National or State Park is a great place to start. “I hate spending quality time with loved ones in a beautiful outdoor setting” – said no one, ever. The summer of 2016 is the 100th anniversary of the National Parks System, which means it’s high time you made the trip. Another important reason to pay the parks a visit? The National Parks and Federal Recreational Lands Pass – otherwise known as the America the Beautiful Pass – is a free lifetime pass available to US citizens (and permanent residents of the US) who have been medically determined to have a disability and this summer is the perfect time to take advantage. For a stress-free trip, do some research ahead of time about which trails are accessible: most National Parks offer some information about accessible trails online – or for a more detailed description. including the surface texture of different trails and their difficulty level, check out our blog series, The ABCs of Accessible Trails. Then grab a friend (or three) and make a day of it! To make sure you’re feeling good all summer long, exercise is key. Not only will the endorphins give you an instant boost, but the long term benefits are numerous as well as crucial to physical and emotional well-being. Even though it may seem counter intuitive, working out actually gives you more energy, not less. However, the best way to get your sweat on is to exercise outdoors. For one thing, beautiful greenery has been proven to raise serotonin levels (which make you happy), while the additional sun exposure increases Vitamin D, optimizing hormone levels. Additionally, exercising outdoors has been known to increase feelings of well-being, lower depression, and increase sensory stimulation. Another important factor to spending the entire summer smiling? Spending as much time as possible with friends and family! As Spring turns to Summer, invitations to weddings, BBQs, and graduation parties will start to pour in – it’s time to get out there and enjoy them! With a GRIT Freedom Chair, it doesn’t matter if the party is on grass, in the woods, or on the beach – pavement is no longer required, and that means you can RSVP “yes” – without the stress. More and more festivals of all sizes and music genres pop up every summer, so no matter where you live or what kind of music you enjoy, your perfect festival is out there. These festivals are multiplying for a reason: for the price of a ticket to a single concert, attendees can enjoy an entire day – or weekend – of music all in one place. The GRIT Freedom Chair is the most versatile chair on the market, designed from the ground up to handle any terrain. From trails to grass to snow, the Freedom Chair is built for you to push yourself. Born out of research at MIT, the Freedom Chair’s patented easy-push levers reduce shoulder strain and put you in control of your mobility. Moving parts are composed of standard bicycle parts, so it’s easy to customize or repair at your local bike shop. Ready to hit the trails? Learn more about the GRIT Freedom Chair at www.gogrit.us. 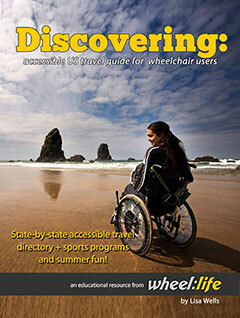 In our latest free book, you’ll discover a state-by-state directory of accessible travel destinations across the United States. These accessible travel suggestions are part of the Get Out & Enjoy Life [GOEL] program that is a joint educational initiative between Wheel:Life, a global community of wheelchair users, and SPORTS ‘N SPOKES magazine, published by the Paralyzed Veterans of America.